Nintendo of Europe is giving plenty of promotion to IronFall: Invasion ahead of its arrival in the region this week, with much being made of the title being a three year project from a three-man studio - VD-Dev. It'll be a rare beast on the 3DS eShop, too, with third-person shooting, 60FPS performance (with 3D off) and online multiplayer all promised. It'll be interesting to see how it turns out, but today has brought some more information on how it'll be available. 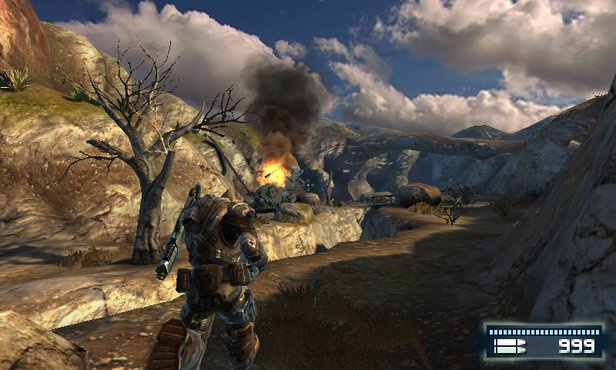 For starters, there'll be a free version that comes with "the first level of IRONFALL Invasion: Campaign plus the local and online multiplayer features of IRONFALL Invasion: Multiplayer, including one multiplayer arena and a limited number of characters and weapons when compared to the purchasable mode." This brings to mind Nintendo's own Steel Diver: Sub Wars, which gave similar tasters to new players. For those that opt to buy there'll be three purchasing options, however. The Campaign and Multiplayer modes will be purchasable separately, costing £8.99 / €9.99 per mode, or they can be picked up for £17.98 / €19.98 together. Those that buy one mode will receive the 'HR' pistol (for multiplayer) as an extra, while buying both modes together comes with the pistol and a music Jukebox that can be used in the game. IRONFALL Invasion: Campaign features 11 action-packed single-player levels, as well as 78 additional challenges that are unlocked as you progress through your overall mission to liberate Earth. IRONFALL Invasion: Multiplayer allows for up to six players to face-off in local and online multiplayer scenarios, with 6 different arenas, classic modes from "3 vs. 3" to "free-for-all", and even the ability to bet in-game credits, which are tied to a player's XP and rank, on your chances of winning a match. On top of this, a Survivor mode gives you the chance to train solo and hone your skills against CPU-controlled opponents within a variety of time-based scenarios. It should be noted that the C-Stick will be supported on the New Nintendo 3DS as well as the Circle Pad Pro on original models - it's possible to play without either, apparently. North American gamers won't be getting IronFall: Invasion this week, incidentally, with the developer tweeting that the title may come to NA in late February. It's certainly interesting to see this approach from an Indie game, and it shows ambition. Whether this title successfully takes over as the go-to shooter on 3DS or struggles to secure many sales is anyone's guess, but it's certainly had plenty of support from Nintendo itself. Are you excited about this one? Let us know. That's actually a pretty good idea....that way you can play it and decide which part of the game interests you more, if you're not going to get the whole package anyway. I seriously think other Shooters should take an approach like this (with reasonable prices of course), because the majority of people aren't even playing the campaign in most of these games. And I think 10€ for a game like this is pretty damn cheap, the devs said the campaign takes about 7 hours to complete (not sure if that includes getting everything on the different difficulty settings or 100%Ing the game in that time, tho) and most people who're into multiplayer will probably get a lot more time out of that anyway. Buying the two together costs more than buying separately (£17.98 compared to £17.76)? That makes no sense. It seems like if you're in the UK buying the modes separately is the way to go. Their pricing seems a tad silly for the UK. I'm not that much of a shooter fan, but given how few of them the 3DS has, how enjoyable they are, and how promising this looks, count me in! I'll try it first, but if it doesn't dissappoint I'll get it immediately after. Bundle deal of the day! £17.76 this has got to be a typo who pays more for buying the bundle deal! Really looking forward to NL review, but I am leaning towards buying the whole package. Well, I rarely play multiplayer or get online, so it's great that we have an option to save some bucks on that. That said, I'm not really interested in the game, but if it reviewed well, I might pick up the single player campaign. I thought Activision could have taken this approach with Call of Duty years ago; plenty of players spend all their time in multiplayer without ever touching the campaign, and vice versa. This is... actually quite brilliant! I never was much of a fan of playing shooters online (too much chaos, and too many people taking the competition too far instead of just having fun), so I'd buy the campaign and see if I can handle it. And if I can, I'll buy the multiplayer, too! Not only does that give consumers the choice of leaving out whatever they're not interested in (most shooter fans don't care much for single player nowadays), the creators can also see how far the general and the specific interest in their title goes! The only problem I see is people complaining about the price, even though 20€ is still a very good start for this title, at least from what I've seen so far. Hopefully this'll become a success - the gaming market in general might be completely overloaded with shooters, but the 3DS isn't really a part of the equation. @ToneDeath It's doubtful they'll ever do it, though, and considering how utterly awful the single player campaigns in Call of Duty have been since Black Ops, it's nothing of value anyway. Love this ideia of a free version that shows the single and multiplayer. I'm tending to get the bundle but be able to see if it's worth it before buying it is something my wallet thanks a lot. Meh, might pick up the single player, will defo wait for reviews. Still no sign of this week's eshop updates? Weird. Must have loads of great surprises for us (doubt it). This is the kind of dynamic pricing I approve of! Bravo VD-dev! so i give it a try someday. I think 20 euros for game with online multiplayer is not so much. (even 10 euro for multiplayer only). But 6 multiplayer maps is not so much. So they need to made more maps or this game die sooner then developers thought. I've seen bread for which the same product (same brand, Reissumies, even) in a larger bag (4 vs 12) costs more per kg. And also CDs "1 for 20€, 2 for 50€" with the extra 10€ going for support to the orchestra. I'm not so sure that reasoning flies here, though. In the first video, with the 3 models next to each other, the 3DS XL is much larger than the New 3DS XL. Im definitely getting this game. Gears of War is one of my favorite games of all time so I'm really excited for this game. I might wait to watch a video on how it plays on the old 3DS tho. I hate stylus controls. Sounds like a good game to me! I'll definitely be giving it a try myself. i don't understand why this can't be together and instead of separated the modes, but oh well i'll plan get this soon! Am I excited? It requiring an NNID has forced me hand here (I assume only the free version will be on the eShop) to not care now as I can't get it. I won't link an NNID to my 3DS as locking it to a single country is silly from a content point of view (especially as I own content not available in the UK). But it being f2p is probably better for the game as a whole though multiplayer might get annoying if you're stuck playing the same map over and over. Anyway the NOE website says it is £8.99 a mode now and points out clearly that you save nothing by buying them together. Sounds interesting, I'm quite a fan of demos/free trials so I'll check this out once it releases. I thought the direct said this week here in NA? Oh well, it's not like I won't have something to play. Separate modes matters to me not as I'll be getting the whole package. Wish it was coming to NA sooner but, this'll give my wallet a short break lol. There's so much to take in this February. Nintendo is doing it right. Sounds like a decent idea. I'm probably going to get the full pack, and I just hope it's able to find sales. The 3DS needs these kind of games. So does the Wii U for that matter. Nice ad, even included the 2DS, very well done for a DL only title. PEGI 12? Again, that's E Plus for ESRB, right? @Jonny @RainbowGazelle seems like that .25 gets you a "free" pistol and jukebox... I hope they rectify this in the NA release. Hmm i'll wait for a review,before i dive in. Looks purchasable on my end whenever it comes out over here. What's the point of having a buy both option if they're the same price? Still, I'll get this game once it hits America to support these guys, but I didn't think it'd be so expensive. 3 times the price of Shadowgun, and I have doubts that it has more content than that. Would've thought it'd be $15 tops, but oh well. Hope they can make money with this. EDIT: Then again, it's just three guys (no clue how big Madfinger Games is), so they each had to do so much more work. Plus they delayed the game by a year just to create a multiplayer mode for their fans. So hopefully the sales are high enough for them to profit. So basically the "Free" version is a demo. That's neat, actually. Reminds me of the old days of playing the Battlefield demoes while I waited for a chance to get the full version (which in those cases never came because I got into them too late...). Considering I won't be able to get a NEW 3DS XL for a while (if ever, that still depends on limited editions...), that might be good to check out. This is coming to be one of the best eShop games on the 3DS imo. Wasn't a fan of the slow combat from SD:SW, but I think Ironfall will appeal much more to me as a 3rd person shooter. I'll probably just snag Multiplayer. They should be combined together so there could be a chance of more online players. They should have given this a retail release tho. The only other "very good" portable shooter I've played is Killzone: Mercenary on the Vita. Exciting to see this kind of game hit the 3DS (and looks very impressive). The gameplay may end up being a bit generic, but with the New 3DS it does lay the groundwork for more "console-like" shooters to hit Nintendo's portable (and future ones). Well, worth a shot. Can't beat free.. And if it's good, I may buy it.. I think this game is going to sell great. Especially if its good. Free to download then decide is a good way of promotion from the get go. People have been screaming for a 3D Shooter on 3DS since day one. Well here it comes and it looks to be good and also dedicated to Nintendo systems only. Letsvsee if it sells like hotcakes. Keen to get me hands on that jukebox bonus, LOL! I am probably just gonna buy the online mode.